Hp choose us like official web reseller. This is a guarantee for. 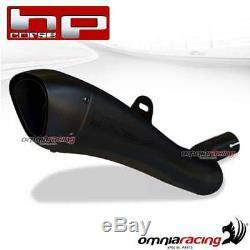 Hpcorse hydroform slip-on ceramized stainless steel black not homologated triumph street triple 765 2018>. The kit includes the link-pipe (where necessary) The exhaust is developed with the original ecu, so the assembly does not require the remapping of the same, or the assembly of additional ecu's. Hp corse hydroform ceramized black cod. Exhaust slip-on racing black low collimated + link pipe for original collector + db killer racing 35mm. Sound charm and power to a higher level. Enclosure: special stainless steel with variable thickness 0.5 / 0.8 mm. Surface finishes: satin and black ceramic. Sound-absorbing material with high sound absorption capacity. Removable dbk with additional sound absorption chamber. 1 increased on request diameter not approved for use in closed circuit. 2 increased on demand diameter 40 not approved for use in closed circuit. Stainless steel rivets in watertight. Logo engraved with the laser beam. Weight 990 gr (without dbk and fitting). All this has not been a decade ago, a reference point in italy; In addition, our products are in demand in Europe and in the United States. It is in the category "auto, motorcycle parts, accessories \ motorcycle \ spare parts \ exhaust systems \ silencer, deflectors".